It’s not buying a new smartphone — so shopping for a new shed should be easy. Yet you’re bombarded by dozens of choices by different companies, in different styles, and at vastly different prices. So, how can you distinguish a sturdy garden shed from a pile of junk? The insider answer: look at the shed siding material. Most of what you need to know about a shed you can learn from the shed siding material. Vinyl siding is the best shed material, and nothing else even comes close. If you’re in the market for a new shed but don’t know where to start, this is the blog for you. Learn why homeowners agree vinyl sheds are the best sheds to own — and how a wooden shed will ultimately let you down. 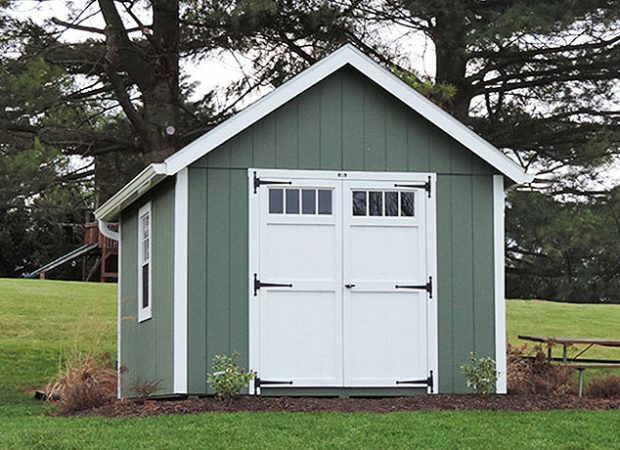 The right shed stands up to the elements, keeps your belongings secure, and doesn’t require too much maintenance. All of those advantages start with the right shed siding. Ultra Low Maintenance — When you buy a shed, you want to solve problems, not add another time-consuming backyard chore. Vinyl shed siding is a tough material that doesn’t need to be stained or patched like their wooden alternatives. 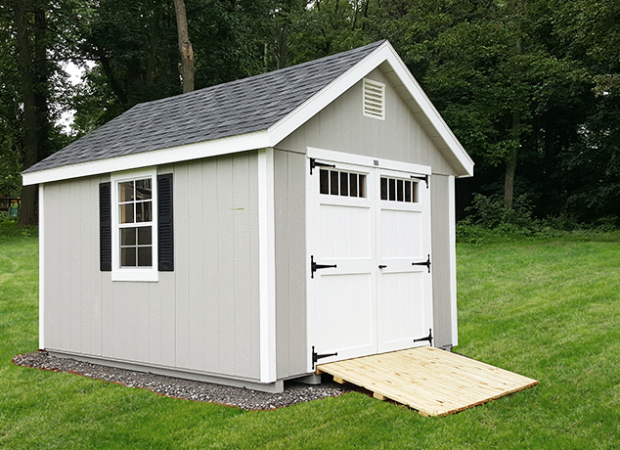 Your vinyl shed can easily last for 20+ years without intensive maintenance — no wooden shed can match that low maintenance durability. Doesn’t Need Painted — Another reason that vinyl is the best shed siding material is that it keeps its color without you needing to repaint it. Just like you don’t need to repaint the vinyl siding on your house, you don’t need to repaint your vinyl shed. That means no extra labor on your part or ever having to buy a can of paint for your vinyl shed. Water Can’t Penetrate — At Glick Woodworks, we’ve replaced a lot of broken-down sheds over the years, and water often plays a huge role in destroying them. When water infiltrates a wooden shed, mold and rot start growing. While water loves to seep into wooden sheds —even the painted ones— it doesn’t stand a chance against vinyl shed siding. Insects Have a Harder Time with Vinyl — Insects and other pests love to burrow into garden sheds for the warmth and to eat anything they can — including the wooden shed itself. Vinyl is the best shed material because it’s far more effective at keeping out insects like spiders, termites, wasps, and hornets. We hate to say it, but a wooden shed is an open invitation to pests of all kinds — and not only are they pesky, but they can cause major damage to your wooden shed. Learn more about pest proofing your shed. Easier to Clean — Over decades of outdoor use, your shed will get a little dirty. Fortunately, vinyl shed siding is extremely easy to clean. To eliminate normal dirt and grime, you can spray your shed down with a hose, just like when washing your house. If you have to eliminate any patches of mildew, we recommend wiping them down with a white vinegar and water solution. Matches Your House — In America today, most homes are made of vinyl siding because it is a durable and convenient material. Choosing a vinyl shed lets you match the style and color of your home to your shed for maximum outdoor curb appeal. While it might not make a difference to everyone, if you have dreams of an HGTV-like home, a vinyl shed is the only choice for style. Learn more about matching your shed to your house. The Right Price — When you’re shopping around, price is ALWAYS a factor, no matter what. For a lifespan that far exceeds ANY other material competitors, you’d assume vinyl sheds would cost an arm and a leg more. However, compared to a wooden shed, an amazing vinyl shed only costs a few hundred dollars more. You can get the best shed for only a small markup — that’s why homeowners agree that vinyl sheds are a bargain! Ready to start exploring vinyl sheds? See all of our shed styles. At Glick Woodworks, we’ve been installing high-quality sheds for decades — and removing cheap sheds that couldn’t do the job right. If you’re in the market for a shed and you want the very best, we recommend vinyl sheds built by true Amish craftsmen. Contact us today to see the difference vinyl siding can make for your shed! Request a Free Vinyl Shed Quote! 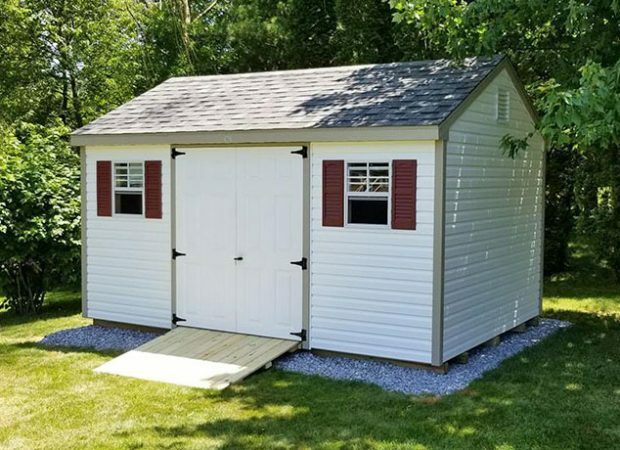 "From the beginning of the purchase process until the delivery of the shed, the communications and service were very professional and courteous. The finished product is outstanding! I would recommend Dave and his team without hesitation."